The common phenomenon is power LED is on, but RUN LED does not blink. Ping failed neither. All ports orange which means it enters into the bootloader (U-Series), this would requires Yeastar support's help to recover. All ports blink in red-green-orange which means it enters into recovery mode. (S-Series). 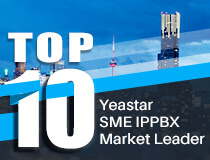 Just try to enter the Yeastar default IP or previous IP address you configured to enter the web interface. Then upload the the firmware(*.bin file). Yeastar doesn't have the duty to recover the data. The boot failure might cause data loss. So we strongly recommended you can backup settings and data periodically. If you don't care the data, you could try to reset the device. Seek help from Yeastar support to confirm it can be recovered.